Tom Stone is the new student at Seward High School and is turning all the girl’s eyes, but it’s Maria McBride who catches his. They have fun together, when they can, but Tom’s father keeps him too busy for much of anything outside of work. Maria tries to visit Tom at home but the creepy assistant Mr. Graves makes it clear to Maria she is not wanted. Not around the funeral home and not around Tom. Tom won’t help Maria; he refuses to stand up to his father. Maria knows she and Tom are meant for each other, and becomes determined to find out why Dr. Stone, who now runs the local funeral home, does not want her around. Dr Stone keeps his son busy in the funeral home’s basement, late at night. Meanwhile, people in Persephone Falls, Alaska are dying in quick succession, keeping Dr. Stone’s funeral home exceptionally busy for a small Alaskan town. Soon, Maria puts the clues she has gathered together. What she finds is a family who are busy recycling . . . in a way Maria has never before seen. 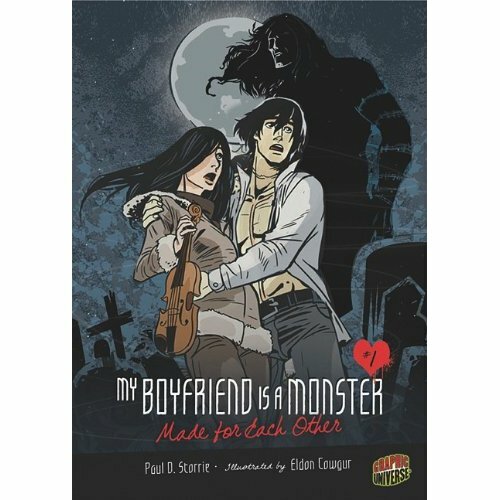 This is the second graphic novel in the My Boyfriend is a Monster series. Once again the story is told in a way that will keep you wondering for most of the tale. . The illustrations, in black and white, are excellent, rendering the characters in a way the shows their personalities. Tom, a sophomore, has the build of Hulk and a stature that nearly matches Michael Jordon (though I doubt Tom knows who either of these guys are). When Tom defends Maria and her three friends, the bullies backs away from Tom, reverting to their true characters: cowards. Maria is rather strong for a young girl who recently lost her parents in a car accident and then three friends in the same manner, prior to the start of school. She accepts Tom without question, even after he tells her his version of Mary Shelley’s Frankenstein. This is one of the best scenes of the book and the illustrations enhance Tom’s tale beautifully. The writing is well paced and authentic, just as the first novel was, and can easily be read in one sitting. When Dr. Stone threatens Maria and her aunt, the action becomes the kids versus . . . well, I’ll let the reader find out on his or her own. I just hate spoilers. Made for Each Other will please graphic novel loving teens as well as the first, I Love Him to Pieces, surely did. Any parent wanting to introduce their youngster to graphic novels, this series is a perfect venue. Strong writing, odd stories with twists unexpected and fine illustrations that will have you looking as well as reading are beginning to be the hallmarks of the My Boyfriend is a Monster series. Made for Each Other and its series are highly recommended.